The koi in this category have a black body with Shiro (white), Hi (red) or Ki (yellow) patterns. It is considered desirable for an Utsurimono to have menware (a sumi marking dividing the head) extending to the mouth and motoguro (black fin joints). The quality of the black is also very important. It must be jet-black with no dull spots or scattered sumi specks. The Shiro Utsuri is considered more valuable than Hi or Ki Utsuri (many times their sumi is a dull black). 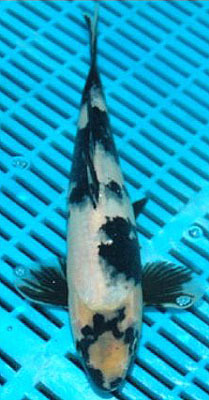 Utsurimono: Black bodied non-metallic koi with one color markings. Black bands should wrap around the body, unlike the black on the Bekko which is more on top (like a Turtle). Black markings should extend from the head to tail. Hi Utsuri: A black bodied koi with red markings. Ki Utsuri: A black bodied koi with yellow markings. Shiro Utsuri: A black bodied koi with white markings. Utsuri are white (Shiro), yellow (Ki) or red (Hi) base color koi with wrapping black pattern forming a checkerboard pattern that starts on the back and wraps below the lateral line. Utsuri were originally stabilized around 1925. Just as the early Showas evolved from the dark, heavy patterns to the modern Showa, so has the new Shiro Utsuri very recently (1990s) evolved to the balance of white and black and from dull sumi to jet-black sumi. The Ki and Hi Utsuri bloodlines have generally not evolved to this balance or to this jet-black sumi. As a result Ki and Hi Utsuri are not as highly valued and their sumi tends to fade away when moved from a dark pond to a blue show tank. They also have a tendency to get scattered sumi specks on their base color making it look dirty. Utsuri also may have the motogoro at the base of their pectoral fins and sumi in the other fins. Utsuri need to have black on the face sometimes in the form of a lightening pattern down the head. Like the modern Showa, only the new Shiro Utsuri can compete with Gosanke on an almost equal footing. Shiro Utsuri do not have the difficulty Showa have of finishing two colors which gives the new Shiro Utsuri an advantage over Showa in finish but Showa have the advantage in difficulty, rarity and high cost. Many of the comments I made earlier about Showa and also about Gosanke can also be said of the new Shiro Utsuri. I expect to see more Major Awards going to the new Shiro Utsuri in the future. There are three types of Utsurimono: Shiro, Hi (red) and Ki Utsuri. The large Sumi patterns of the Utsurimono are like the Showa Sanshoku. The Sumi predominates over the contrasting colour, giving the koi an overall dark image. The Sumi is required to have the same characteristic features as that of the Showa Sanshoku. Shiro Utsuri need Sumi on the head, some times the Y shaped head, and nose Sumi combination style is found. A lighting shaped head Sumi which divides the face into two parts is preferable. Equivalent patterns to the Showa are desirable for the body, but large, imposing Sumi markings are preferred to a small checkered one. The Shiro Utsuri are koi with large black and white markings. They are said to be of the Magoi linage. The white should be pure, forming a clear contrast with the Sumi. Imposing blackness, making the black and white a striking contrast. The body of the Utsuri are usually wrapped with Sumi, The pectoral fins should have the characteristic Showa Motoguro. Ki Utsuri are the black and yellow koi of the Utsurimono group. Black stripes are desirable on the pectoral fins. Dark and V shaped Sumi markings are preferred for the Ki Utsuri. Bright orange-yellow suits it best. Tiny Sumi spots appear on the base yellow, which is undesirable. Hi Utsuri are the red or deep orange and black koi of the Utsurimono group, and like the Ki Utsuri, black stripes are necessary on the pectoral fins. The contrast of Hi and Sumi is striking. Like the Ki Utsuri many tiny Sumi spots appear on the Hi areas.